This modern villa is comfortable and perfect for outdoor living. The newly painted villa is an independent house and the pool is not overlooked. The large garden is totally enclosed. Accommodation on one floor, nicely furnished with all modern comforts. Plenty of space for sunbathing and if shade is sought, there are lovely terraces around the house and a roof terrace. Shopping in Estoi and Sao bras about 5 mins drive. Shopping centre jumbo in Faro on the way home from the beach. A car is necessary. As we often use the villa ourselves we have provided it with all amenities: dishwasher, washing machine, microwave, dvd, satellite tv, air-conditioning and a remodeled kitchen. Estoi is well known for its palace that has become a pousada and for the roman villa. Both can be visited. A welcome pack can be prepared on simple demand (to be paid at arrival). We renewed the bathrooms in 2016 with walk in rainshower. We live in Belgium and we have 3 children, one boy and 2 girls. My wife and I work, but we spend most of our holidays in Portugal, where we have friends and have fallen in love with the country. Since 1980 we have been travelling all over Portugal, and we know every spot. The Algarve is our preferred region especially the Ria Formosa Natural Park. We and all our family love Estoi because of the beauty and peacefulness of the area. There are many beautiful beaches and places of interest in the neighbourhood like old Faro town and Olhao fish market. 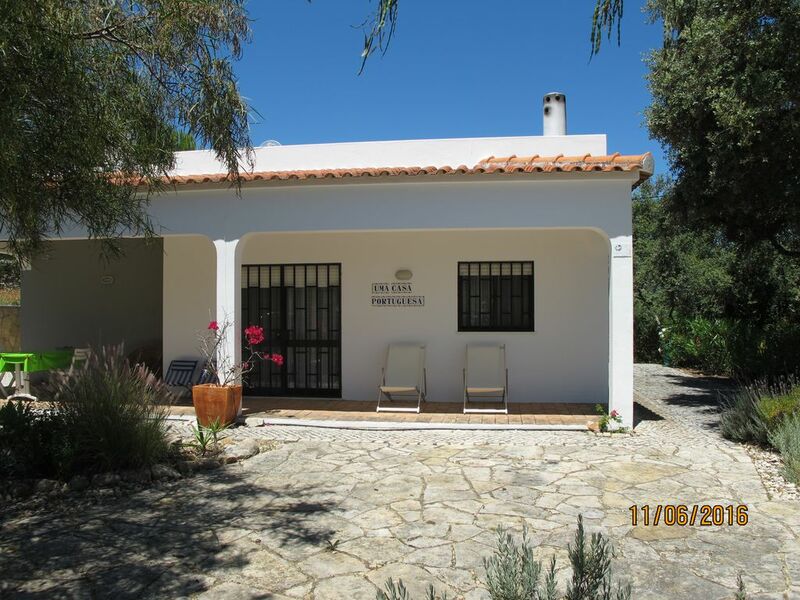 The area is easily accessible with Faro airport less than 15 minutes drive away. The climate is sunny and dry. The property is quiet and rest giving. Just 20 minutes drive to the city of Faro and an ample choice of beautiful beaches. The pool is private and comfortable with a large barbecue area. We provide for information about delicious restaurants when booking. The highlight is the garden. We are landscaping the garden in front of the villa and around the pool area. En-suite bathroom to bedroom 2, with basin, shower and toilet. second bathroom with basin, rain shower , wc. Living/dining room with working fireplace for cooler evenings. Reversible air-con (cooling and heating). Seats and sofas and a sleeping bed for 2 adults, stereo installation. Sky news on tv with dvd player. Well equipped kitchen with dishwasher, table top oven, delta coffee machine, fridge, freezer, microwave, electric cooker, toaster. Complete new kitchen with vitroceramic cooking plate, wine storage. Fire blanket and fire extinguisher. Air-conditioned. Within reasonable distance of local golf courses: quinta do lago, pinheiros altos, san lorenzo, vale do lobo, vilamoura golf, vilasol, moncarapacho. Most are within a 20 mins drive. tenniscourts in bordeira at 10 minutes, prices on internet. Loved our stay. Very private, which is what we wanted. Great pool, well equipped house. David was a great host and sorted anything that came up very quickly. We were a family of five and it was perfect for us. Pool was great! I would highly recommend this property and will definitely re-book. I sincerely hope you will re-book next year. a very well appointed villa, very clean and well looked after. we had total privacy around the pool and were not too far from any of the local towns and the airport. Lovely location, peaceful and private. The villa was everything as described. We really enjoyed our stay. David was helpful and available for advice if needed. Thank you. A fantastic gem in the tranquility of the Algarve. What can I say! This outstanding property was everything we hoped and more. Fantastically equipped, comfortable and so beautifully cared for. Great location, very easy to access and convenient. The property manager David is a delight and such a fantastic person to know you have on hand. If you need some peace away from it all, THIS is the place to go. Thank you so much. Thank you Tim for your enthusiasm! We loved the villa which had everything we needed. Very clean house on arrival and all utensils, cutlery, crockery, glasses etc very clean and plentiful. We were disappointed on our arrival on the Sunday as the pool was very green and looked uncared for. David did sort it out on the Monday and all ok after that. It was a bad first impression. We felt that lighting around the pool/garden would have added to making the environment for eating out in the evening even more enjoyable. The two spotlights were a bit too harsh. Overall you have a beautiful home and we would highly recommend it. We will improve the lighting around the pool with solar powered lighting. New to this area are biking and walking tours in the algarvian countryside;bikes can be rented in Estoi. The ria formosa is a lovely area where all kinds of waterbirds including stiltons and flamingos can be watched. Via algarviana is a foothpath that goes from alcoutim to cabo vicente and passes through sao bras de alportel a few miles north of our villa. Visit the website on internet for more details. Location: 5km N of Estoi, 8km SE of Sao Bras (all facilities), 15km NE of Faro (all facilities, airport, beach). 15 min to Faro Beach. 20 min to Pedras del Rei Beach (near Tavira) . Other beaches in Sao Rafael, Praia da Falesia, Monte Gordo. From the pier of Olhao water taxis or a passenger ferry can be taken to the idilic islands of Armona, Culatra and Farol. Deserted beaches,restaurants & bars at your choice. Faro airport (15km), sevilla airport (150km) car hire is essential. Try the following airlines for cheap flights: easyjet, monarch, jet2, thomson, mytravellite, xl, ba, tap, brussels airlines. A car is essential and all the major companies operate out of faro and sevilla airport. We can recommend avis or travelrent on parking 4. Estoi: 5km, Sao Bras: 6km, Faro: 15km, Tavira: 20km. The historic old town of Estoi shows the Palacio do Visconde(became a Pousada) and Roman Ruins of Milreu.The market towns of Olhao and Loulé are around 15 minutes away. Several supermarkets in Sao Bras de Alportel:Pingo Doce, Lidl and Intermarché. Hypermarket Jumbo in shopping centre in Faro. Several local restaurants are in an area of 10km. Daily market in Sao Bras de Alportel and Olhao, special market on Saturday in Olhao and monthly in Estoi and Moncarapacho. Market in Loulé not to be missed on Saturdays. We are just 30 minutes from the border with Spain and a wonderful drive along the River Guadiana. Estoi is famous for the Palace do Visconde (The Pink Palace) which has become a Pousada Hotel which can be visited and for the Ruins of a big Roman Villa which can be visited also. We are close to the Ria Formosa for bird spotting. This is a family owned property and over the years we have discovered many superb local restaurants. A book of recommendations is available in the villa with directions and comments. We welcome your new suggestions. Booking Notes: 50% deposit on booking, full payment within 30 days before arrival. Deposit is non-refundable. Please note that the max. Number of sleeps (6p and 1 baby) may not be exceeded under any circumstances. Cancellation: deposit is not returnable, we recommend to subscribe a travel insurance with owners direct. A security deposit of 150 euro is required .. This will be refunded at the end of the holiday assuming there are no damages to be deducted. Changeover Day: Changeover is flexible . Arrival between 2pm and 9pm on the starting day. Leaving before 10am on the last day. Notes on prices: Prices are for the property per week in Euros. Prices include electricity, heating, air-con, water and maid service. Earlybird reduction of 10%. After season reduction of 10%.A security deposit of 150 Euro is required.